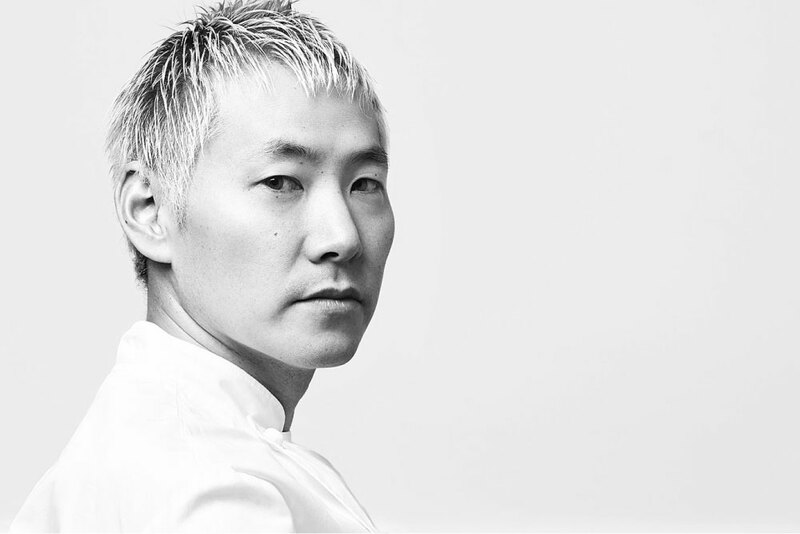 L’Archeste, a one Michelin Star restaurant in the prestigious 16th Arrondissement in Paris where Chef Yoshiaki Ito presents playful modern French cuisine imbued with focused Japanese precision. If we weren’t avid readers of foodie information we would never have found L’Archeste. The website is virtually nonexistent, only listing days of the week and opening hours, with absolutely no indication of what there might be to eat there or who might be cooking it. As for making a reservation, there is only a telephone number which is tricky when trying to book from the other side of the world. 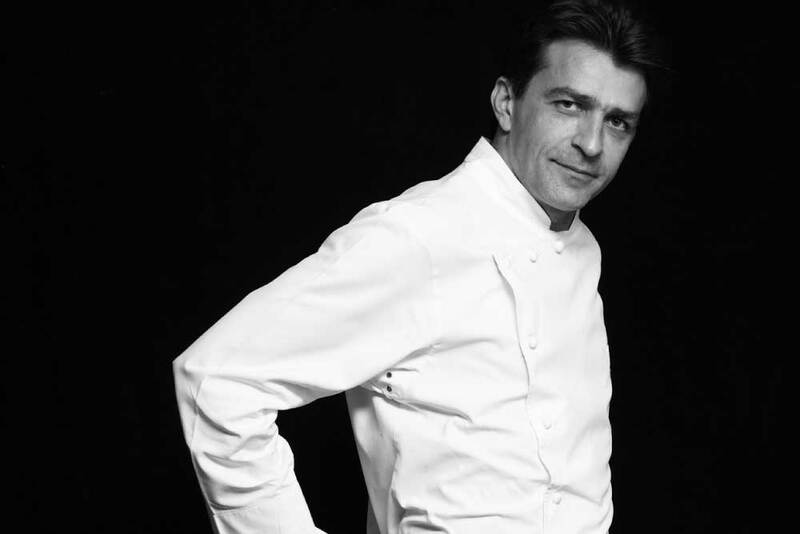 Fortunately in exploring new Michelin Star holders my love somehow found L’Archeste and managed to make a reservation. 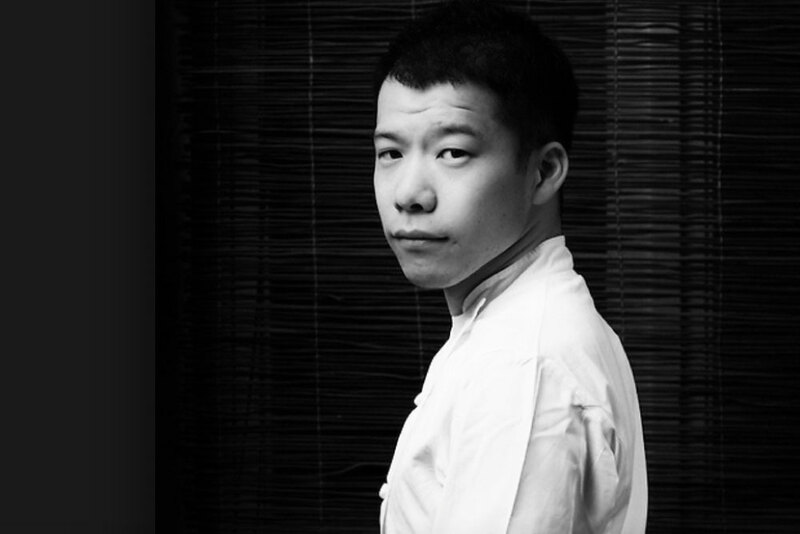 With a bit of digging around we find that Chef Yoshiaki Ito opened L’Archest in September 2016 and has swiftly earned himself a Michelin Star. We were keen to discover what might be hidden away in this strangely illusive restaurant. 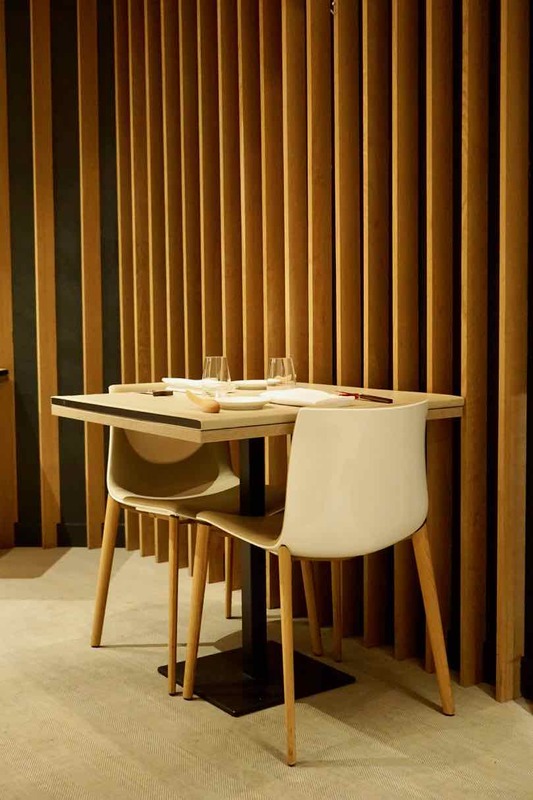 Immediately the decor speaks of Japanese influence with its simple, earthy aesthetic. I loved the blonde timber chairs lined on the inside with cosy pale leather and backed in modern high gloss acrylic. Stunning blonde timber slats wrap up the wall and around the ceiling playing with light and tone to create a very Japanese style sense of serenity. We are seated at the front of the restaurant right next to a deep windowsill with a beautiful flower arrangement and the perfect spot to take in the whole space. 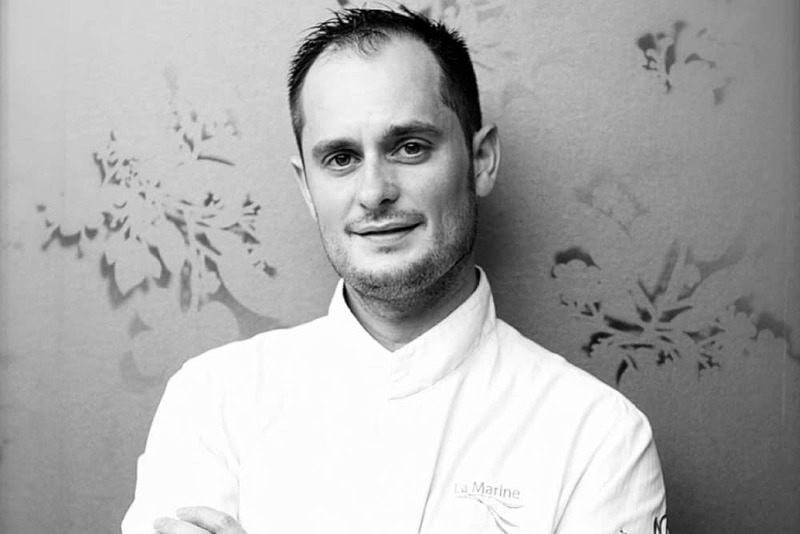 Bertrand is our Sommelier and manages the front of house. 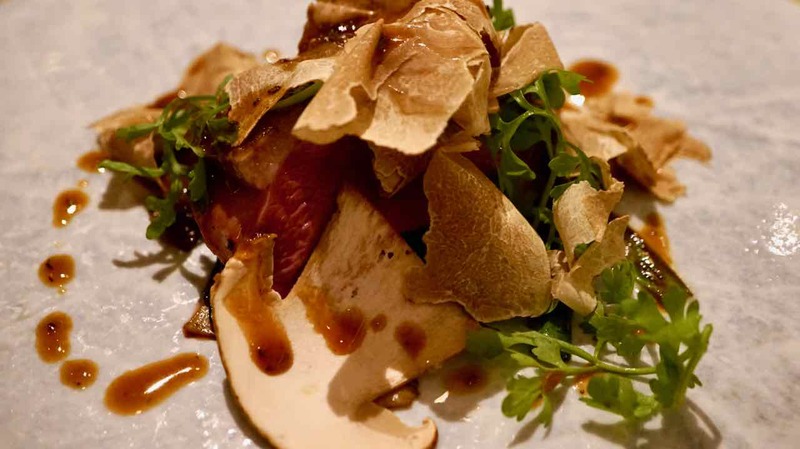 He chatted with us about the menu and shared fantastic stories of his white truffle hunting with Chef Ito, in Italy. Hearing his passion and excitement about how they source their product, we are intrigued to see how it is used in the menu. The menu this evening is our favourite kind, a surprise menu, where we are completely in the hands of the chef. 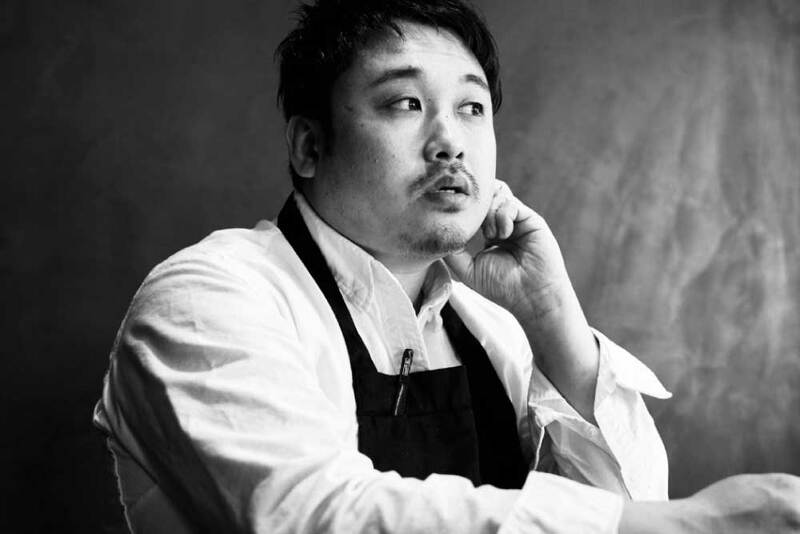 With so little information to be found about Chef Ito, it is very much a surprise. Suddenly jumping out of the quiet serenity comes a bright glossy cobalt blue plate, an absolutely flat disc of clay, glazed with a blue of unbelievable intensity I am overwhelmed with plate envy. Atop the plate are two timber spoons piled high with beetroot, under which hides a lovely horseradish cream. To the side a tiny purple carrot cut lengthwise and lightly seasoned and dressed. A plate that very much speaks of seasonal produce prepared simply with a focus on the purity of each ingredient’s flavour. 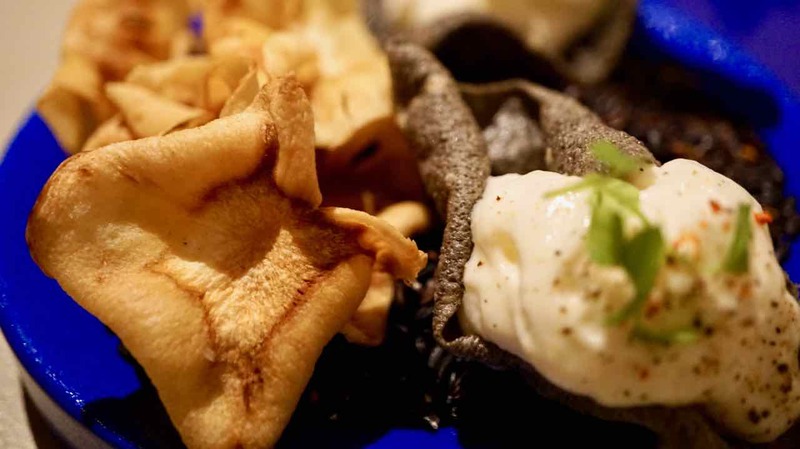 Another of the stunning blue plates brings more delicious little tasty treats, parsnip chips that are sweet and earthy and squid chips filled with a velvety haddock mousse, that as a mouthful have everything going on. Next a plate with two small cups snuggled into a nest of hay. Here we have potimarron soup with a mocha mousse. Potimarron is also known as a winter squash, it is a deeply orange little pumpkin, absolutely packed with flavour. 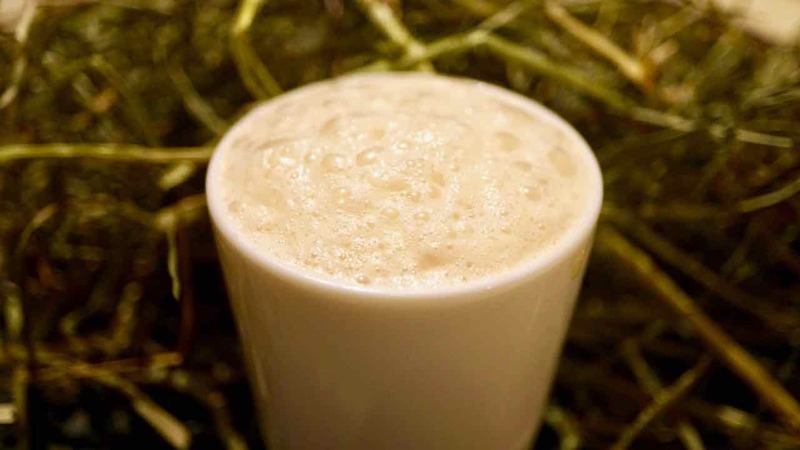 The thick soup is delicious, with a nutty almost chestnut like hint and the light foam is a delicate balancer to the richness of it. 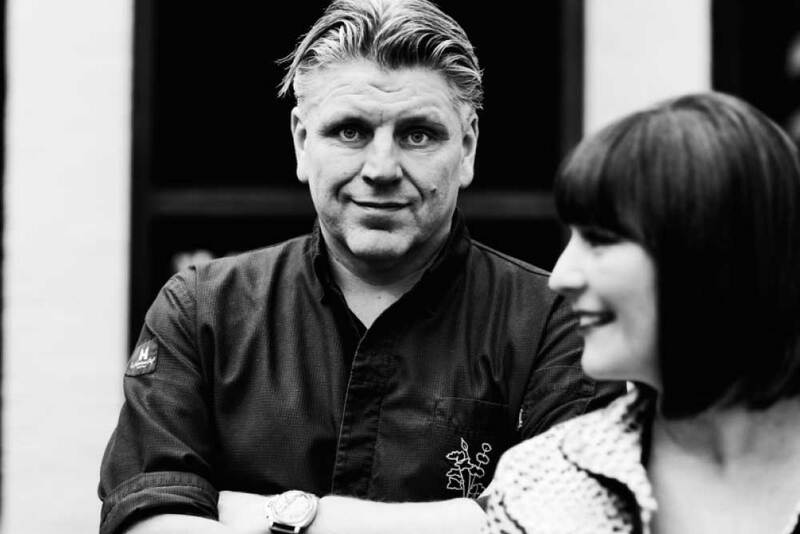 From our first few tastes it is very clear that we have discovered a very, very good chef and we are excited about what is yet to come. Our next two plates celebrate tuna from St Jean de Luz, a seaside Basque fishing community in southwest France, close to the Spanish border that is known for sardines, anchovies and tuna. 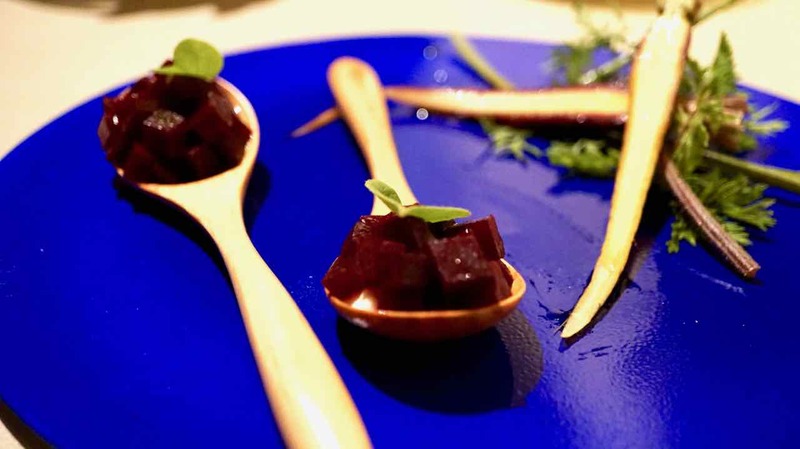 Chef Ito has presented stunning quality wild tuna in two ways. 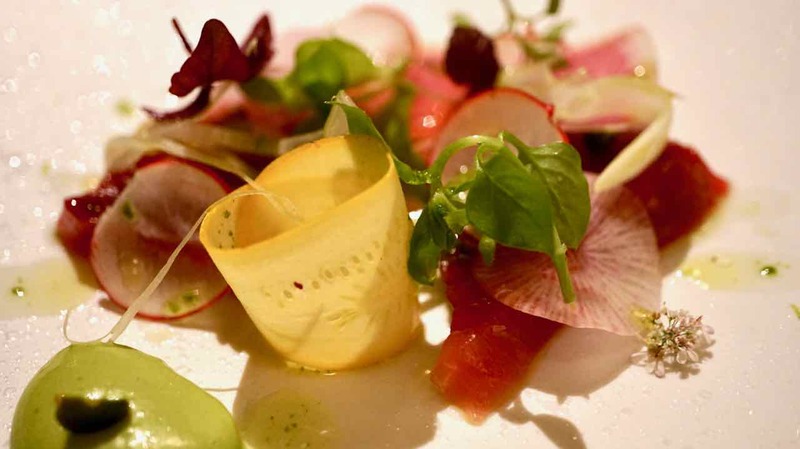 Firstly raw tuna, refreshingly pure in a very pretty plate with vegetables dressed lightly with a liveche sauce and lifted with a flourish of bergamot. There are little pops of something that remind me of popcorn! 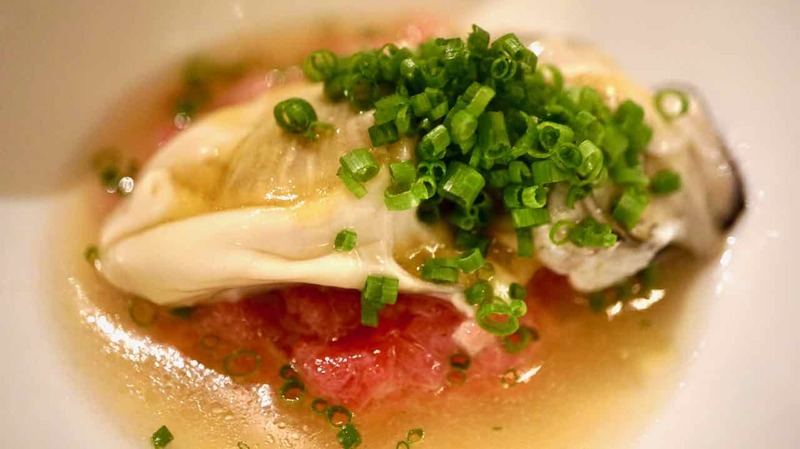 In the second plate, the belly tuna, toro, is served with lightly poached oyster and simply decorated with baby chives. There is a harmony of the creaminess of the Toro and the oyster that just sings. 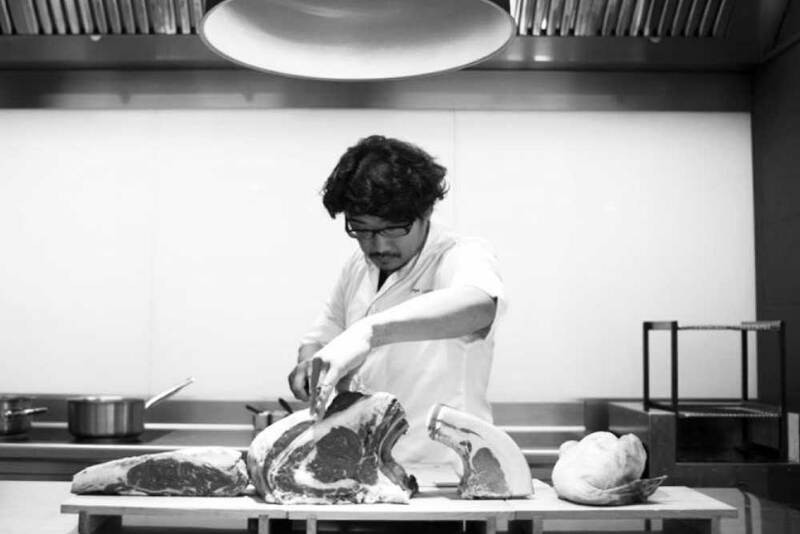 Chef Ito has shown so much restraint in the simplicity of these dishes, he has respected the purity of the ingredient and put his care and attention into structuring plates that focus on the natural beauty and essence of the tuna and the oyster. A pretty little creamy blue earthenware bowl with a rich golden edge holds an amazing treasure, Lobster from Bretagne with Parmesan risotto and Girolles mushrooms. Lobster from Bretagne (Brittany) black and shiney with blue highlights, is sought after for its firm sweet flesh. Deeply red orange when cooked it looks extremely pretty in this bowl with the golden colour of the girrolles. 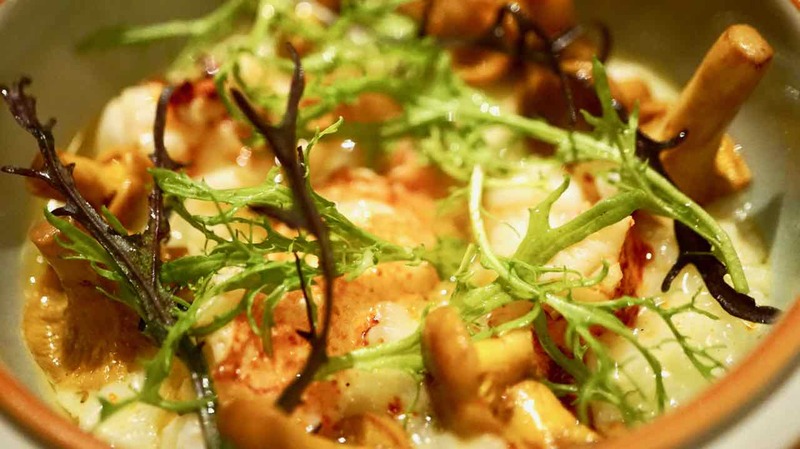 The mildly cheesy risotto provides a perfect foundation that connects the sweetness of the lobster and the delicate earthiness of the mushrooms. We are also given a little cup of lobster cream to drink or pour as we wish. Keeping the lobster bisque separate to sip on as I like is perfect as it allows me to taste the the sweet tender meat of the lobster and follow it with the powerful echo of the bisque. Our next plate is scallops from Finistere with mashed corn and Jerusalem artichoke chips with a sauvignon grape sauce. The scallops were perfectly golden and delicately translucent inside and such a surprisingly good marriage of flavour with the corn and the light sauce. The little crunch from the chips was a lovely touch. Chef Ito then appeared on the floor carrying a large board with 3 big fat golden brown ducks on it. He presented them to us and each table with a quiet reverence. It was clear these were very special ducks and soon to be on our plates. 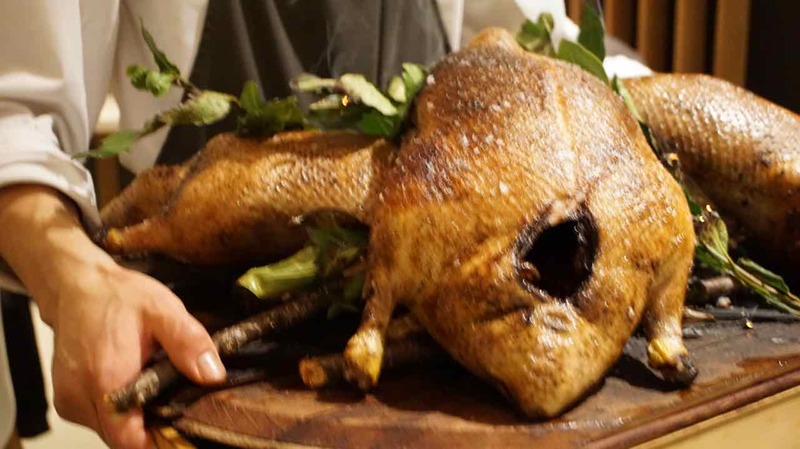 Chef Ito uses Challans Duck, known to be the best duck in the world and his producer Mr Burgaud is known as the best Duck producer in Challans. They are a free range duck and the meat is distinctively dark red tender and juicy. Our duck course is served with chanterelle, crepes and trompette de la mort mushrooms there also delicately poached duck livers. A wonderful sabayon sauce with anchovies is spooned over the duck at the table. And we also enjoy a generous shaving of the white truffle that Bertrand was telling us about. 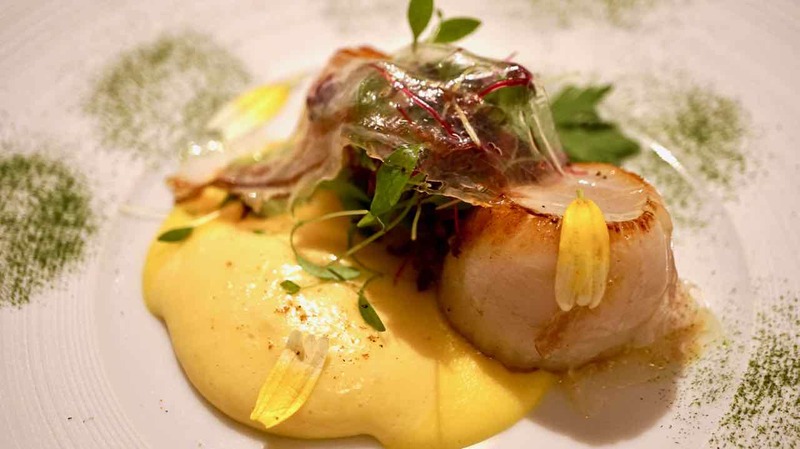 A very very opulent and elegant dish. To finish our meal we enjoyed two most excellent desserts. Firstly a fascinating cacao sorbet with vanilla crumble and Japanese whisky chocolate ganache and a little slice of black fig. 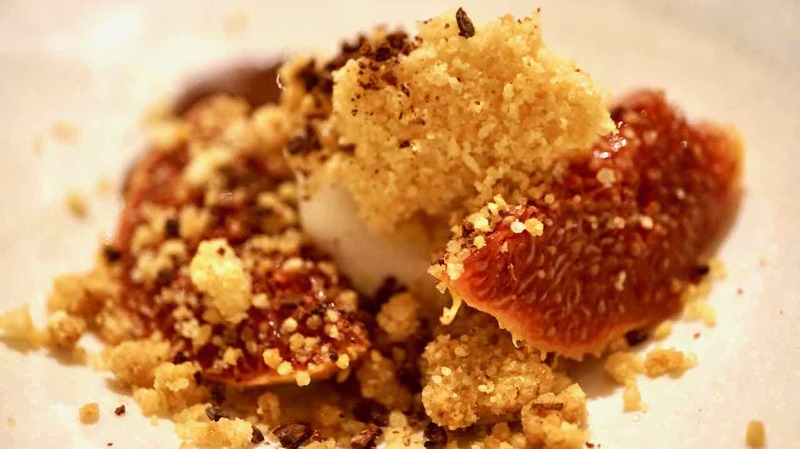 This plate had everything going on, the light refreshing sorbet with rich boozy ganache and the perfect amount of crunch. Our final dessert was beautiful and light, fragrant and refreshing. 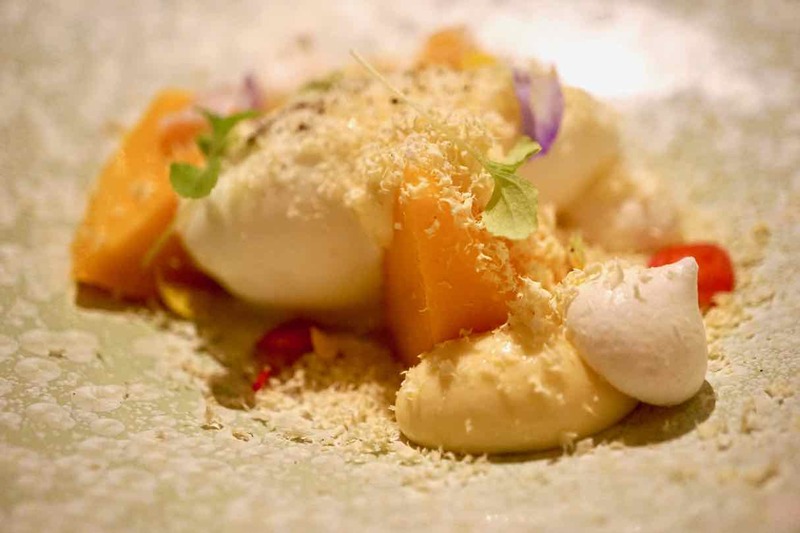 Fromage blanc sorbet little pieces of mango, citrus fruit cream with chocolate passion fruit dusted over and the final flourish a little zeste of Yuzu, zested at the table filling the air with vibrant citrus notes. What a delightful way to finish our evening. We have certainly hit the jackpot finding L’Archest. Chef Ito has wowed us and surprised us. Tonight we have enjoyed very carefully and deliberately sourced produce which has been thoughtfully and creatively prepared with a great deal of skill and precision. Chef Ito was waiting at the door when we left to say goodbye. He seemed a solemn and dignified fellow, I think there was great pride in his work and I felt honoured to have had the opportunity to enjoy his food.